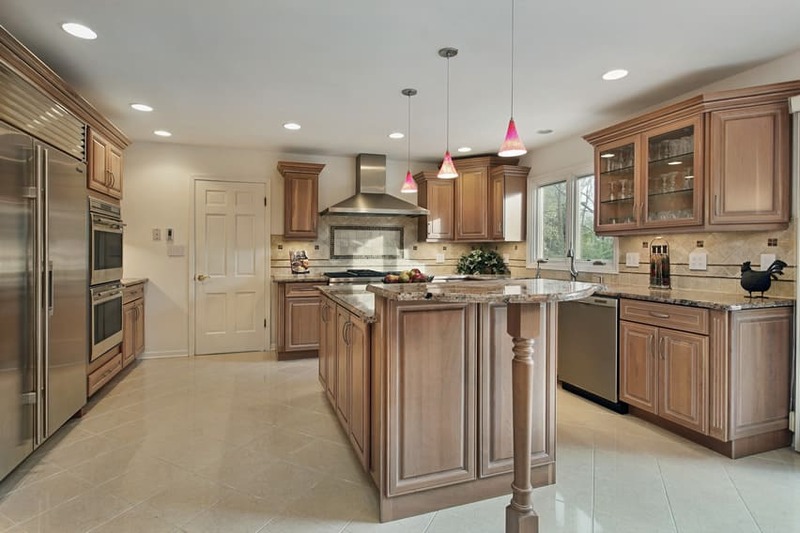 This is part 3 of our luxury kitchen design ideas with custom cabinets picture gallery. You can find (kitchen ideas part 1) and (kitchen ideas part 2) on this page. We hope you enjoy these beautiful kitchens with custom cabinets, luxury finishes, elegant lighting and open layouts as much as we do. For the image above the combination of classic architectural details and antique kitchen pieces creates a space which exudes a classic and elegant charm. Beautiful crystal pendant lamps adorn the yellow-painted coffered ceiling and bordered by an intricate ceiling rose, while the floors are of large slabs of natural stone tiles for a more rustic appeal. 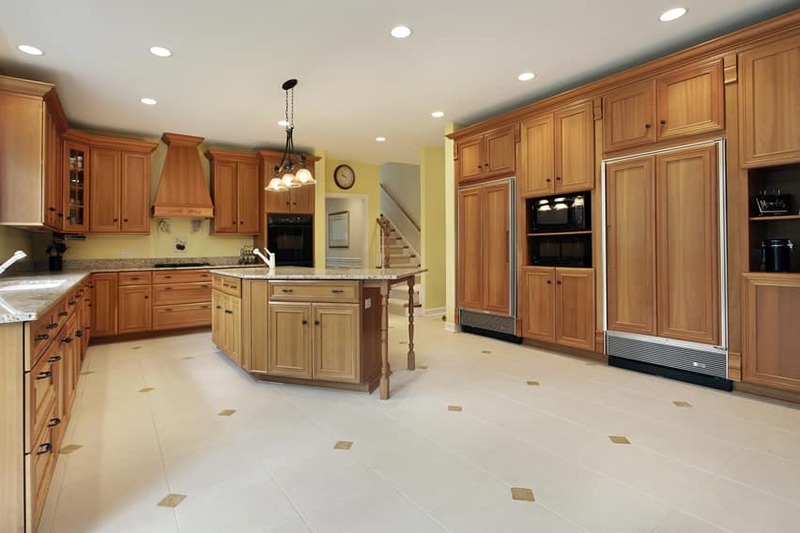 The main kitchen cabinets are in a light yellow finish which matches the color of the walls, while the free-standing cupboards and counters come in a variety of wood finishes. 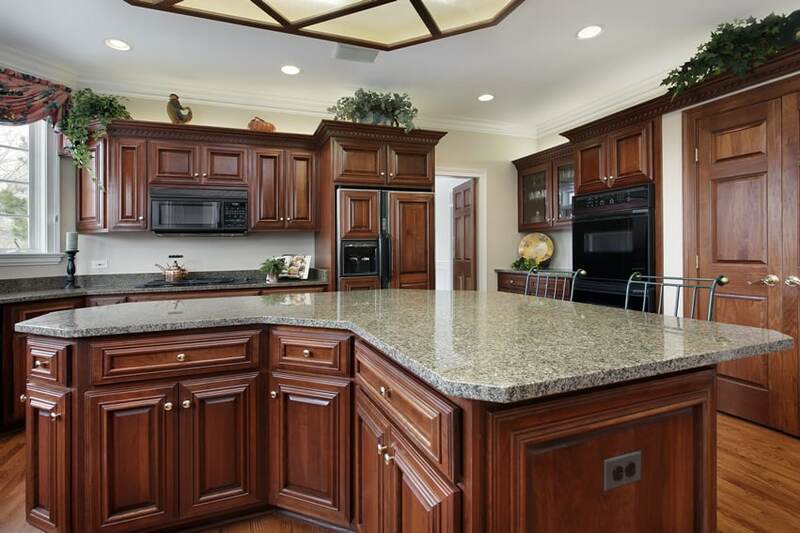 There’s a large Walnut cupboard with a matching bar counter and 4 bar stools, a cherry wood cabinets and a red mahogany island counter with green granite counter top. This kitchen’s main focal point would be it’s very unique gray-green colored kitchen cabinets with simple & elegant gold detailing. These gorgeous cabinets matches the color of the wall’s wood siding and helps enhance the beauty of the Maple wood countertops. Other built-in furniture pieces are also painted in a gray-green color like the small breakfast nook by the window. The black ceramic tiles for the backsplash adds to the elegant look, while the hanging display of pots, pans and baskets gives the space a more rustic and homey appeal. 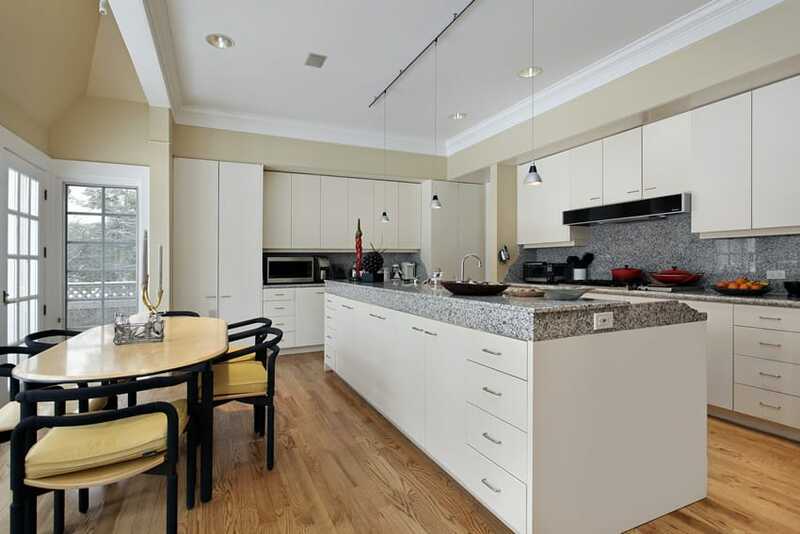 An open-plan kitchen which uses modern cabinetry in Mahogany laminate finish. 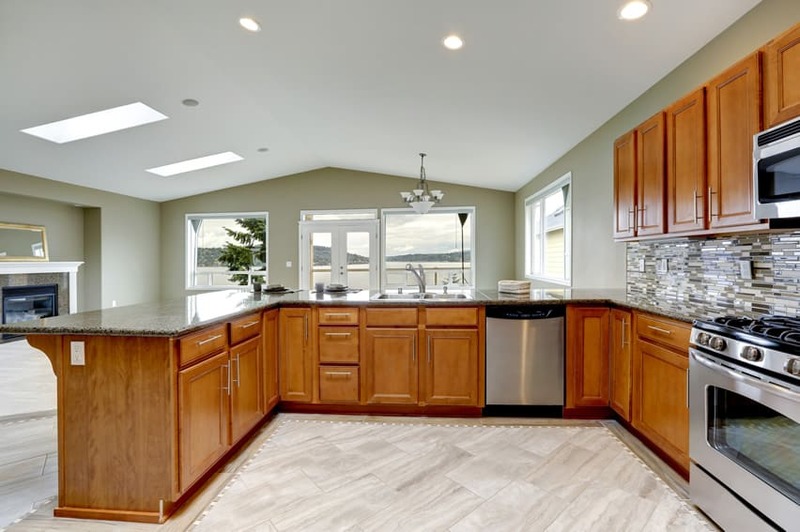 All kitchen cabinets uses the same laminate finish and uses the same beige granite countertop which matches the beige and cream mosaic backsplash tiles. The island counter accommodates 5 metal barstools with black velvet upholstery and also serves as the central dishwashing area of the kitchen. Despite using traditional-style white cabinetry, this kitchen space adapts a more modern styling. It uses plain off-white walls and white ceramic tiles bordered with black ceramic tiles for its floors to maintain a neutral background for the other elements of the space, and the kitchen opens into the living area, making it a kitchen perfect for entertaining guests. The white kitchen cabinets are paired with a thick slab of salt & pepper countertop with flat nosing for a modern appeal to match the modern stainless steel appliances. 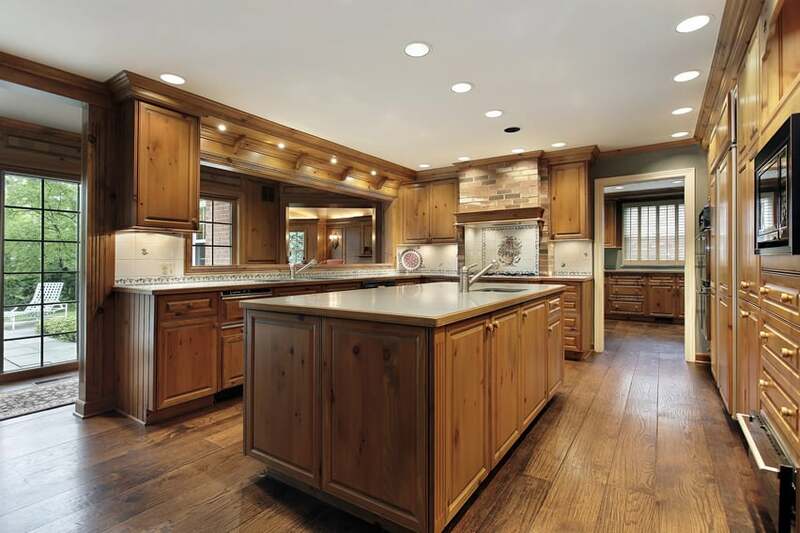 This large kitchen has a warm over-all glow attributed to its choice of lighting and flooring material. Floors uses ingenious solid bamboo planks while the lights used are generally in warm white, rendering the space in a warm color. In addition, the kitchen cabinets ostensibly combines Walnut in its natural non-varnished finish and a varnished Walnut finish, creating a space which uses multiple colors of wood while maintaining the same color palette. For this kitchen design, a traditional look is achieved by the combination of traditional architectural elements such as the exposed wooden beams & French windows, and traditional finishing techniques like the faux marble paint finish. The natural Oak kitchen cabinets completes the look, and is combined with engineered fruitwood floors and an island counter with antiqued black finish and a solid mahogany countertop. Shiny beech wood engineered floors and a matching yellow tone wall paint serve as the bright background in this modern kitchen design. 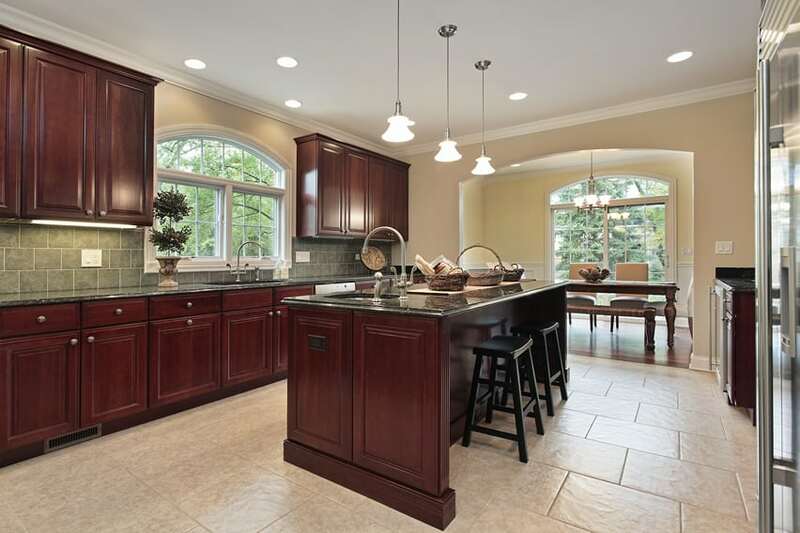 The warm and bright main finishes complements the cherry wood laminates of the cabinetry and helps highlight the black granite countertops. 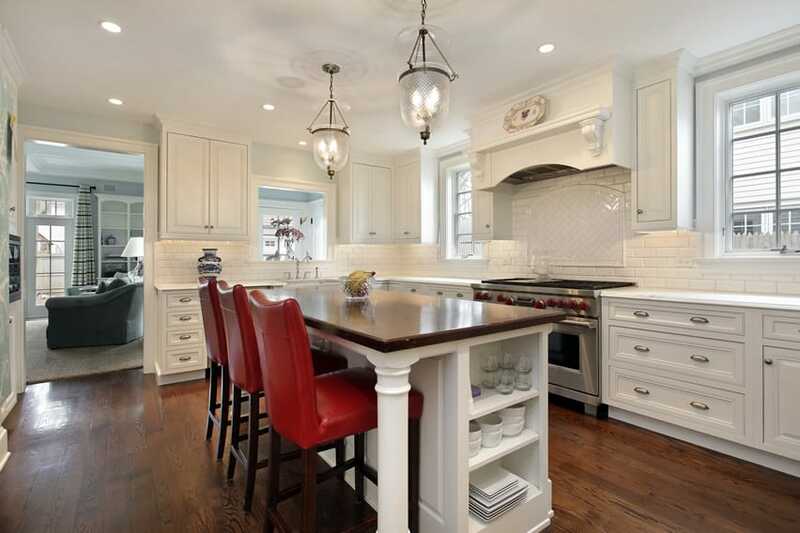 Despite the simple design, the cabinets are ornamented with crown moldings and corbels. For this simple all-white kitchen, the red upholstery of the barstools seems to attract the eye’s attention as its color stands-out from the plain white background. All cabinets, including the center island are in white, and even the countertops are white with the exception of the center island’s wooden countertop. The white ceramic subway tiles adds texture to the backsplash walls, but still keeping true to the white palette. This kitchen goes for an all-light yellow scheme. 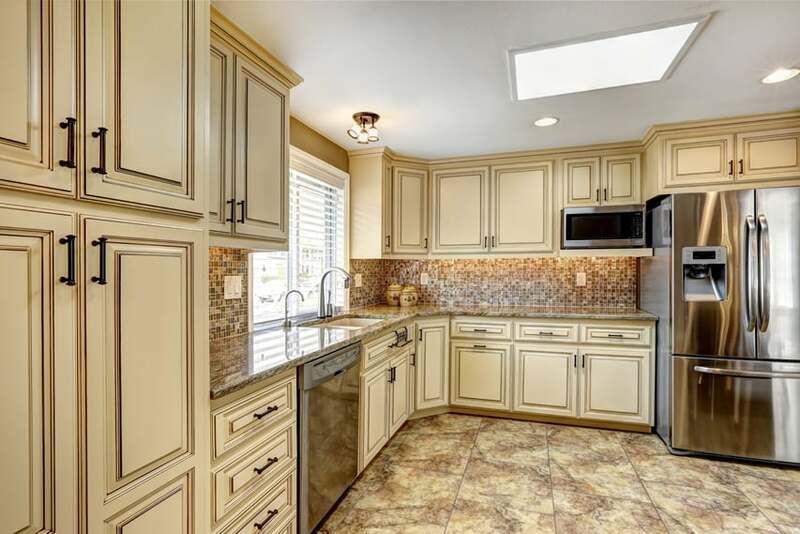 All cabinets and island counters are painted in a light yellow color and uses a matching light cream granite countertop and light yellow ceramic tiles for its backsplash. However, the white ceiling, walls and floors helps tame down the yellows, and even the cool white lights help neutralize the warm tones of the cabinets. 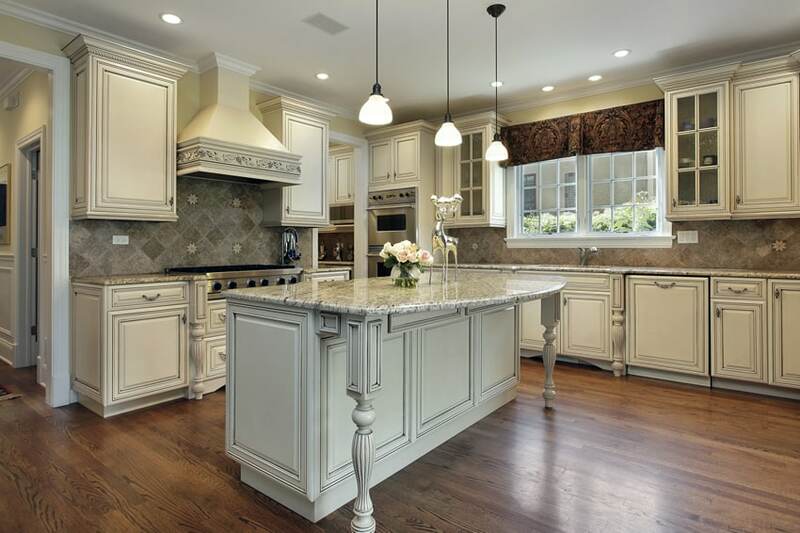 Similar to the example above, this kitchen uses traditional-style cabinets and painted in a light cream color. But instead of white walls, ceiling and floors, this kitchen goes for the darker colors, using a beige color for the walls and black-stained wooden floors, creating a contrast which brings your eyes towards the lightest element in the space which is the white center island. Instead of the usual floor tiles, this kitchen opted to use black-stained wooden floors instead, instantly giving the space more personality. Its main kitchen cabinets are in white and stands-out for the black flooring. The cabinet doors uses vertical slats and this repetitive vertical elements help visually enhance the height of the cabinets, making them appeal longer. 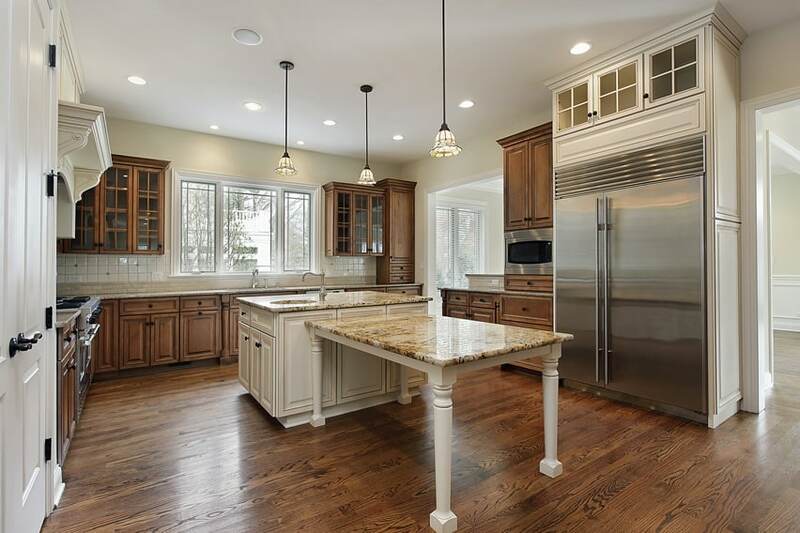 All the counters uses black galaxy granite and the center island counter separates itself from the rest of the cabinets as it has a natural oak finish and matching rattan bar stools. The best point of this kitchen is its unique and open layout. 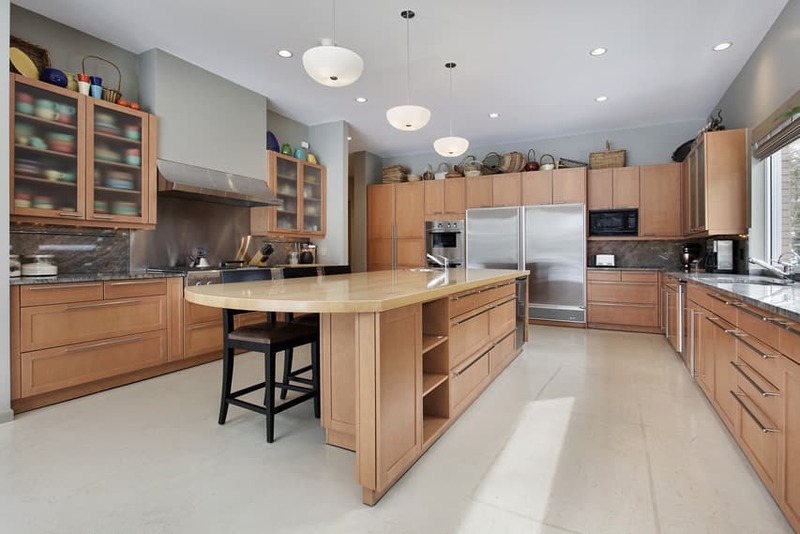 Although the kitchen itself is not that large, the open plan helps make the space bigger, and also make it a perfect venue for entertaining and serving guests as its quarter circle island counter opens up to the living/dining area and has space for dining as well. As for its finishes, the cabinets are uniformly stained in a nice Teak wood finish with also matches well with the granite counters, the Beech wood floors and the beige walls. This modern kitchen efficiently maximizes space by utilizing one whole wall for storage, combining cabinets, drawers and built-in appliances. 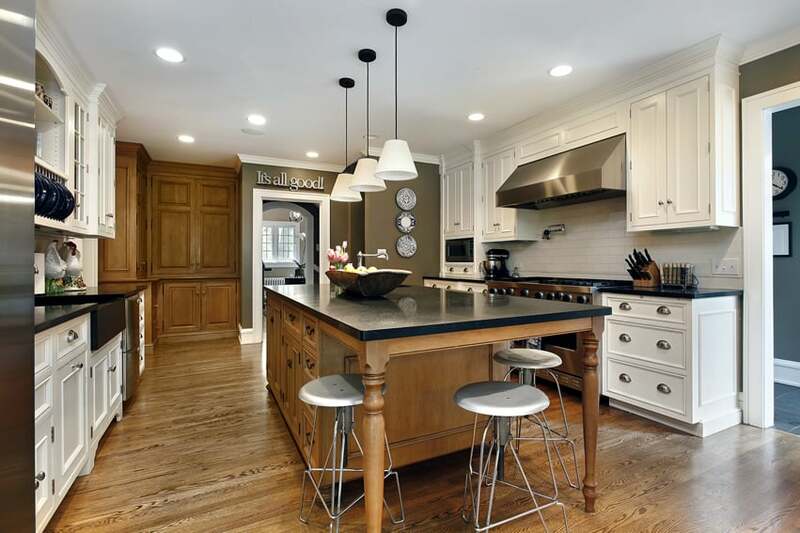 The colonial maple finish of the cabinets has orange undertones which complements the yellows of the engineered beech wood floors, while the gray salt and pepper countertop serves as a good neutral surface to balance the dominance of warm colors in the space. 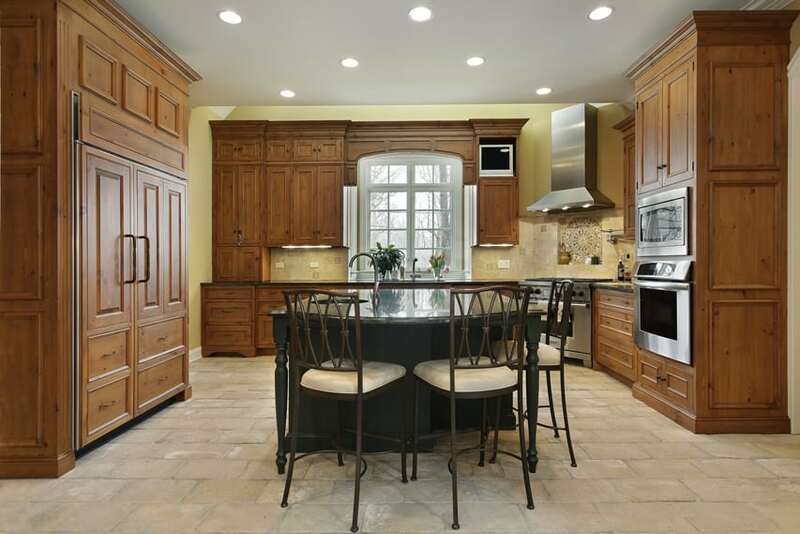 A modern space with traditional styling, this kitchen boasts of charm common with traditional kitchens. It combines traditional forms and furniture pieces with a more modern approach such as using traditional style kitchen cabinets but using walnut laminates instead of traditional stain and varnish, the use of Tiffany Pendant lamps for accent and the use of period-style furniture pieces (bar stool and dining chairs). The combination of modern finishes and period styles gives a lighter and more refreshing feel to the space. This modern kitchen has a semi-open layout which directly connects the kitchen to the dining area through a large opening. The kitchen itself is kept simple, with light peach textured ceramic floors, red oak laminated cabinets and emerald green granite countertop which matches the green stone tiles used in the backsplash. The light yellow walls helps make the space look brighter despite the use of dark-tones woods. A charming modern kitchen which exudes a homey appeal despite being very minimalist and simple. For starters, the washed look of the Engineered Maple floors serves as a good background to help give more warmth to the look of the kitchen. The cabinets are laminated in white, but opts for a matte laminate finish instead of high-gloss common in modern kitchens. This is paired with salt & pepper countertop and backsplash, which has a very unique application in the center island, utilizing it as the fascia for the upper counter surface. This kitchen simplifies the look of traditional cabinets and translates it into more modern forms with less moldings and ornamentation. 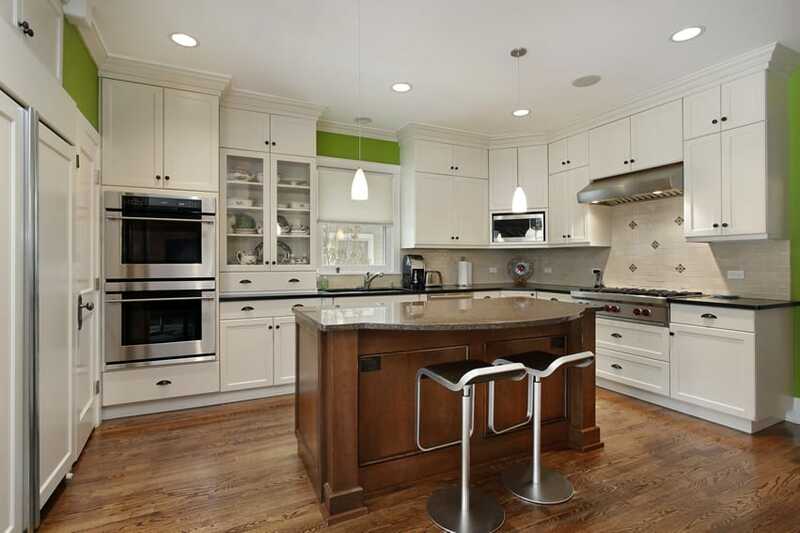 Cabinets are all in matte white and uses brushed stainless steel pulls to match the stainless steel appliances. Main kitchen counters uses black granite paired with white mosaic tile backsplash, while the center island uses carrara marble, giving it a more elegant appeal. Having a lot of windows and natural light works to the advantage of this kitchen design as it uses darker woods for its kitchen cabinets. The white ceramic tile floors and generous natural light helps balance-out the dark walnut finish of the cabinets and make it appear less intimidating. The open layout of the space also contributes in making the kitchen feel more spacious. Yellow walls and diagonal beech wood floors give a visual illusion of a bigger space, and serves as a great backdrop for the Walnut-laminated kitchen cabinets. It uses a unique gray countertop with black veins which extends to the whole backsplash wall, creating a seamless look. Artificial lights concealed under the overhead cabinets and the pendant lamps help illuminate the space, giving it warm glow and more conducive for food preparation. The charm of this kitchen is the washed-out finish of its Oak wood kitchen cabinets which gives the whole kitchen a subtle warm glow with a slightly rustic appeal. The glossy ceramic tiles of the floros help give the space a more streamlined appeal, and the warm white lights used helps give a warmer color to the plain white walls. The beige countertops matches the color of the cabinets leaving the fuchsia pendant lamps above the island counter the single welcomed pop of color in the kitchen. 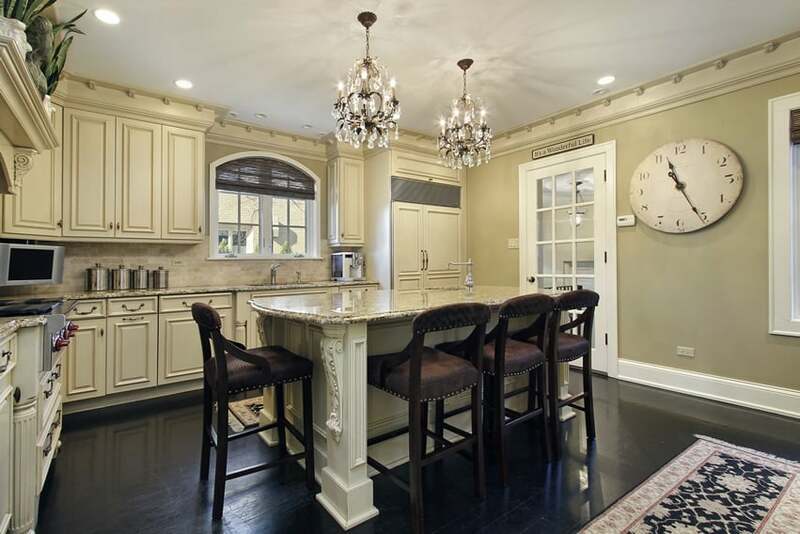 Detailed moldings and turned supports give this kitchen a luxurious appeal with its attention to detail, but makes it less intimidating by opting to use off-white color finish instead of wood finishes. This is combined with salt and pepper countertops which closely matches the gray undertones of the cabinets and the dark gray stone tiles used in the backsplash. The cabinets have a slightly distressed look without being too overwhelming to give a French kitchen ambiance..
A lovely modern dark wood kitchen which uses a unique combination of colors and finishes uncommon in traditional style kitchens. For starters, the walls of the kitchen area separates itself from the rest of the house as it uses a dark gray paint color which extends up to the ceiling. A combination of skylight and large picture windows help illuminate the gorgeous Provincial oak laminates with very visible graining which were used in the kitchen cabinets. Counters uses black solid surface and paired with gray mosaic stone tiles for the backsplash. The brushed stainless steel finish of the appliances, pendant lamps and even the dining table and chairs help complete the polished modern look of this kitchen. It is unusual for kitchens with traditional style cabinets to make use of bright colored walls, but this kitchen design dares to be different with its bold use of Lime green walls which adds a vibrant pop of color to the white kitchen cabinets. The center island separates itself from the main counters as it uses Oak laminates and combines it with very modern stainless-steel barstools. 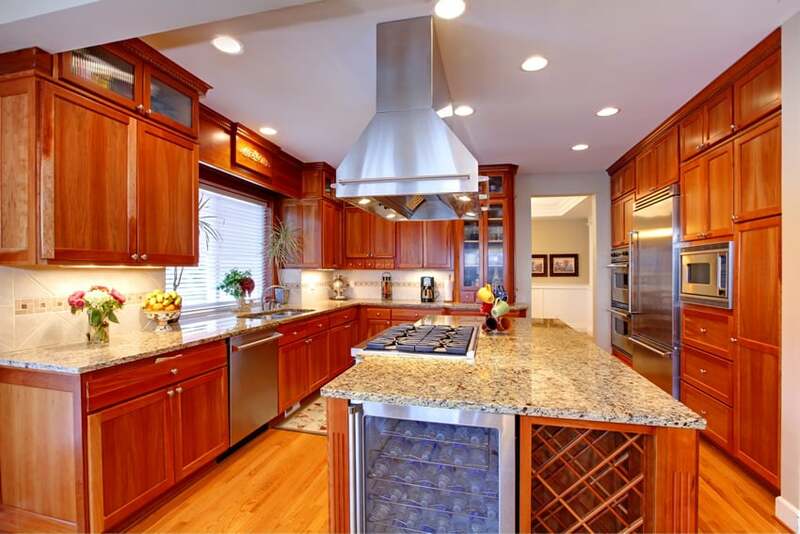 Taking an unusual shape, almost triangular, this kitchen dons mahogany wood and granite tops. Even with the unusual shape it is simple in design, manifested by utilizing long straight lines, and using simple knobs and moldings. The kitchen island is also used as a bar where people may have breakfast in the morning, grab a quick meal, drink coffee etc. For accent, basic black bar stools made of iron with upholstered seats are used. 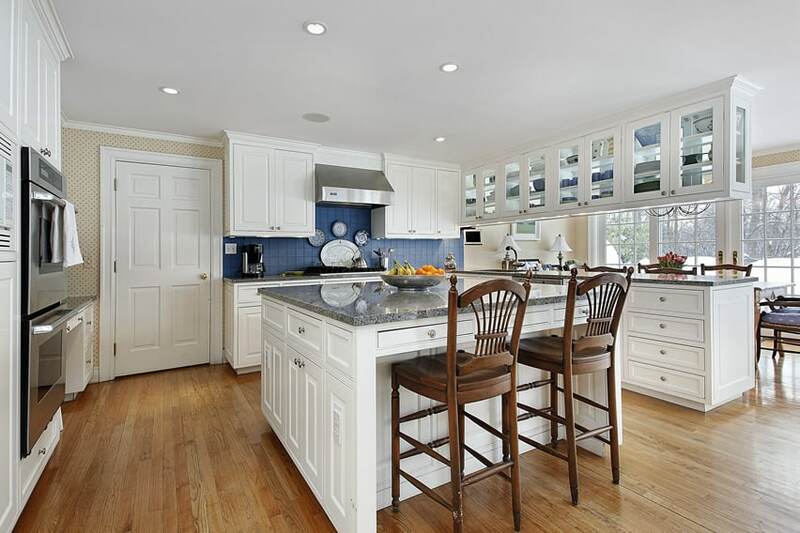 The kitchen, in mostly wood, provides strong contrast against the living area which is mainly blue and white in color. Thus creating a clear division between the kitchen area and the living area despite the home being an open area design. 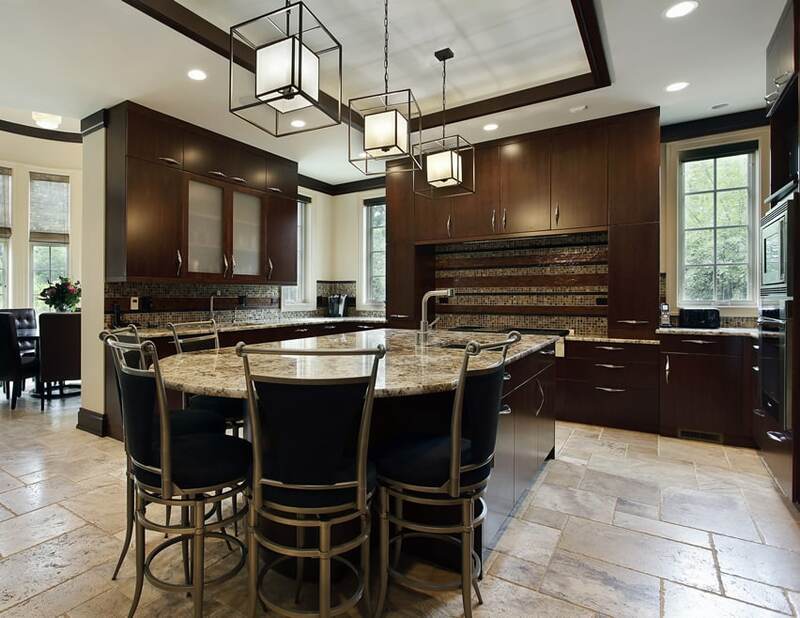 This kitchen completely rid of using overhead cabinets, making it more visually spacious and clean. One side of the kitchen is within a niche in the wall which also adds to making it look and feel spacious, because there are no protruding fixtures from the wall. 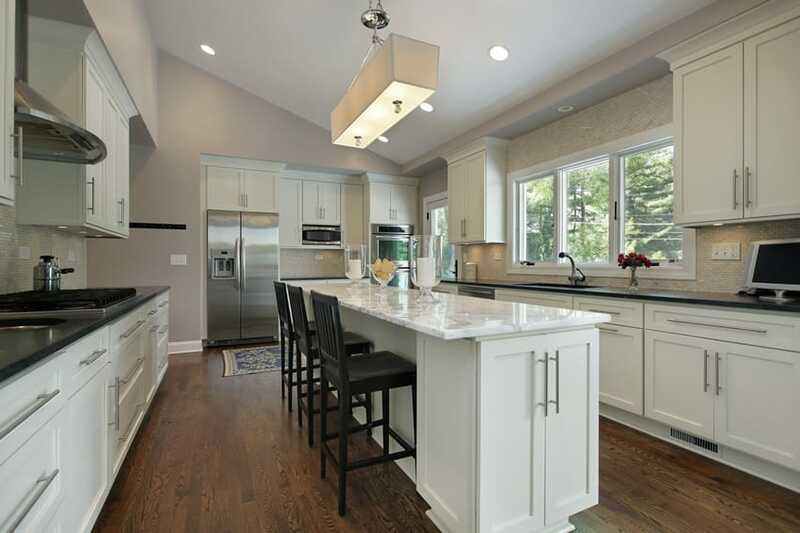 Also this kitchen went with neutral colors for a more simple design, using unpainted wood for the fixtures, white granite for counter tops and off-white paint for the walls. However, it still used moldings to give the kitchen certain grandeur. The kitchen is placed adjacent to the stairs and used the dead space as pantry. Using rounded corners, the kitchen creates a more fluid flow of traffic or sight. It is also a safety measure for children (or even adults) prone to hitting the kitchen counter corners. The overhead cabinets are made of fiber glass for easy maintenance and for that glass-like finish. The kitchen’s color is of shades of white and even using white marble for the counter tops. 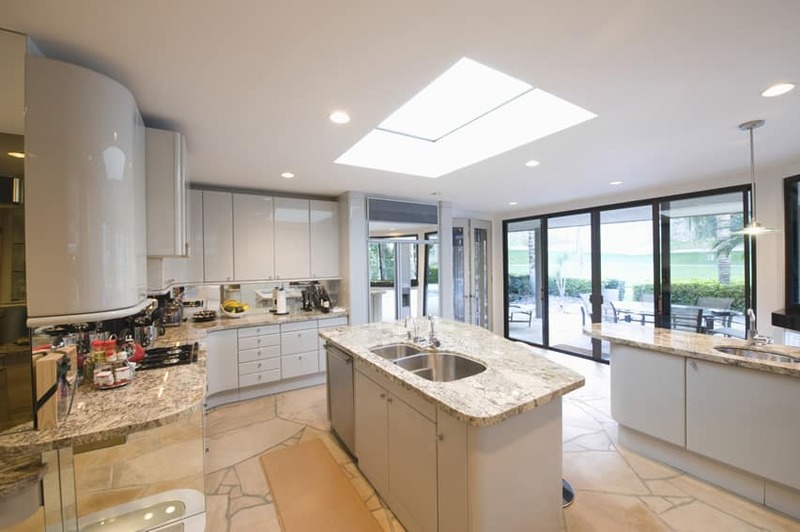 The floor made of stones give it a natural/outdoor feel which is then complemented by a nice skylight, directly above the island, letting natural light in the kitchen, and also saves electricity. A kitchen that reminds you of camping cabins, exposed wooden beams give this area a cozy and warm feeling. 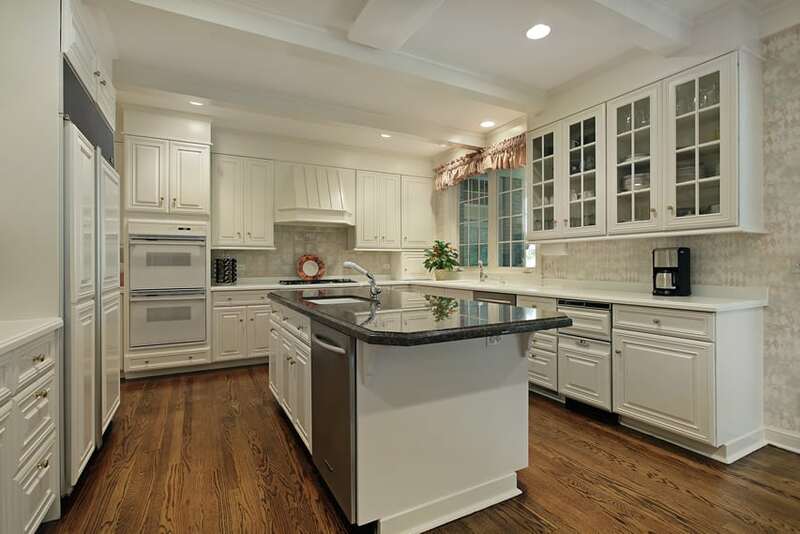 White granite counter tops give a good contrast against the wood used for the fixtures. The range hood, painted white with edges laminated with mahogany, keeps the natural feel of the space. Natural texture and colored tiles gives the space a bright and clean look to lighten up the space mostly made of wood. 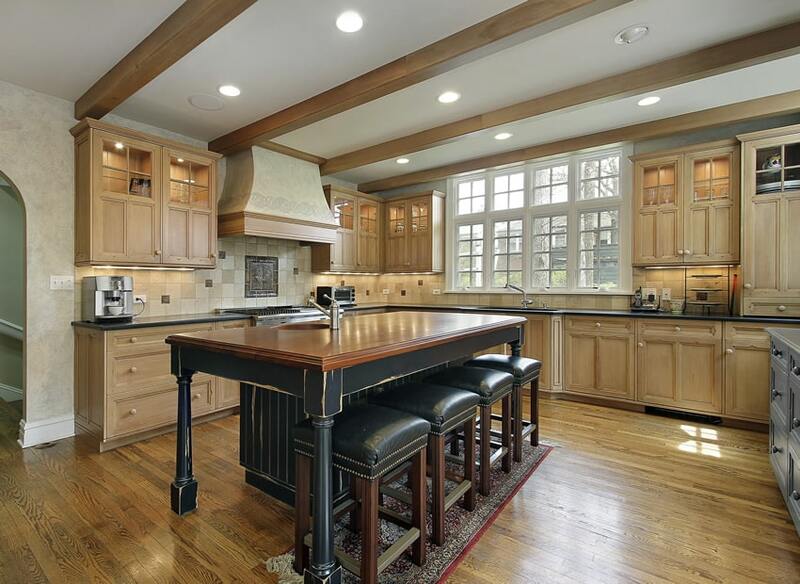 Instead of using a lot of space for counters, this kitchen used a particularly big island. Used Brazilian Cherry for overhead cabinets and Brazilian Oak for cabinets to give a certain difference to the two kinds of cabinets. Also it has two different granites for counter tops, Baltic Brown for the island and Kashmere white for the counter against the wall. Three simple pendant lights are used for the kitchen island to give ample light for cooking, meal preparations and eating. This small kitchen design takes it easy on the ornamentation and focuses on the beautiful finishes used in its surfaces. With very modest white floor tiles and white acoustic ceiling boards, the investment goes to the cabinetry. 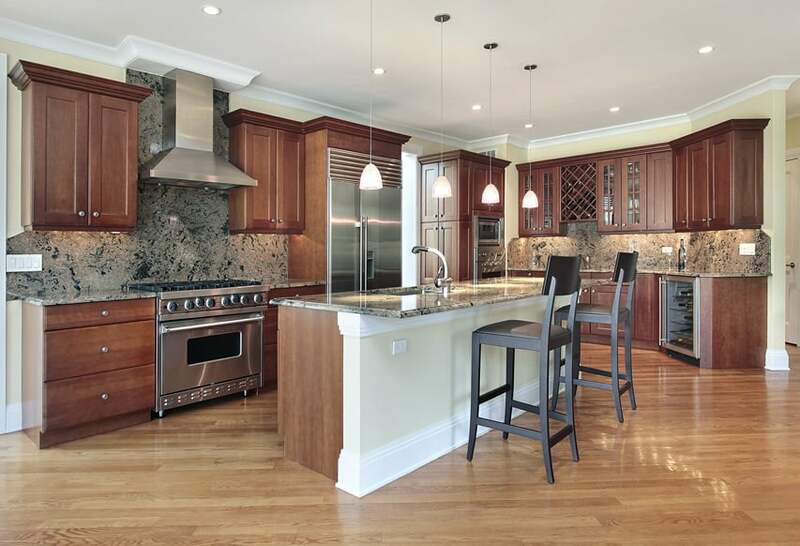 Kitchen cabinets have Cherry wood laminates and uses frosted glass on some of the overhead cabinets. The lights inside the frosted cabinets help showcase what’s inside and, functionally speaking, makes it easier to look for items in the cabinet when it’s dark. 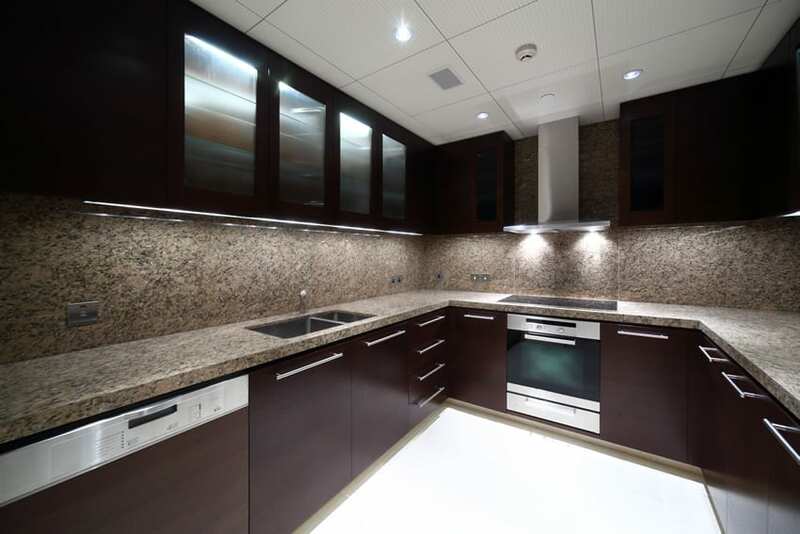 It also doesn’t hold back on its use of beige granite as it is found not only on the surface of the countertop but also all throughout the splashboard. A very functional traditional style kitchen which uses classic white flushed door cabinets and salt and pepper granite countertop. The white cabinets makes it easy to combine it with bolder colors and patterns such as the cobalt blue backsplash tiles and the patterned wallpaper of the walls. 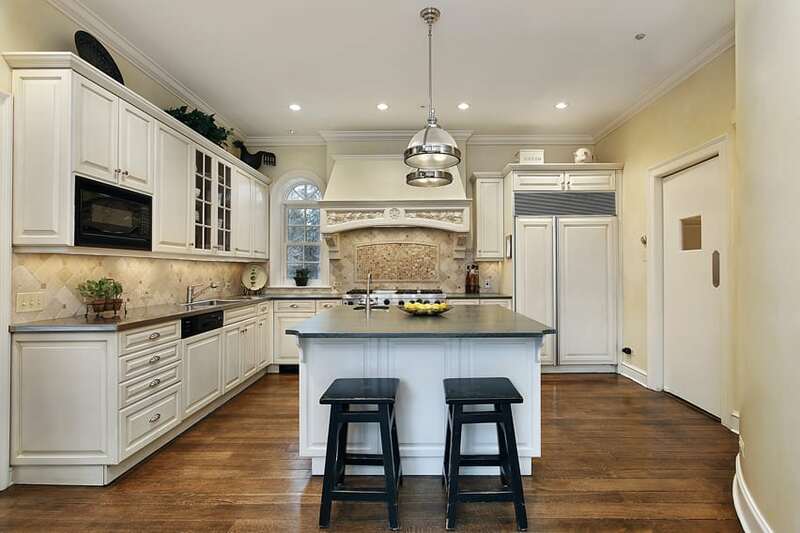 Aside from an island counter, this kitchen also has a separate breakfast counter overlooking the dining area, with an overhead display cabinet, making it able to accommodate more diners. Basic finishes for this kitchen space were kept simple and plain, using white ceramic tiles for floors and gray paint for the walls, creating a good neutral “canvas” to play around with. Despite the neutral background, the kitchen cabinets are still kept simple as well, using uniform Ipswich pine laminates for all the cabinets. 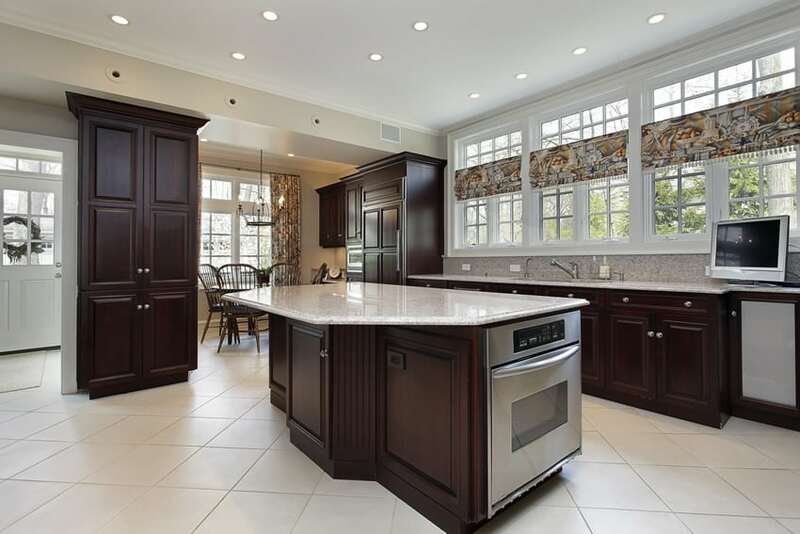 Main kitchen counters uses granite for its countertop and the backsplash, while the large island counter uses a light brown solid surface material. 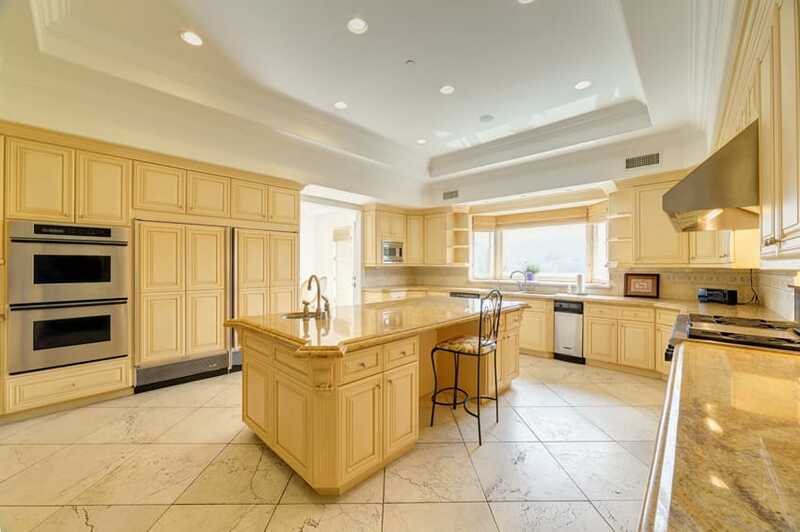 This kitchen with peninsula is another open-plan type of kitchen, but a little smaller in size. Due to the space limitation, storage is maximized through a combination cabinets and drawers, as well as built-in appliances. Cabinets are solid Glden Pecan wood, giving it a more luxurious appeal and uses brown granite countertop and glass mosaic tiles for the backsplash. This is a traditional kitchen design with an eye-catching set of barstools with zebra-print upholstery. 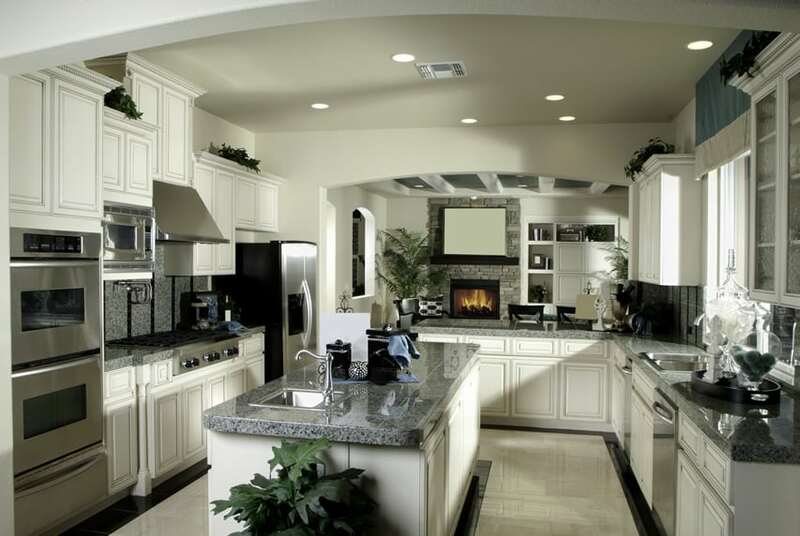 While most of the cabinets are the traditional white painted cabinets, it also combines it with beige colored cabinets. All countertops are in white marble and combined with gorgeous off-white mosaic tiles which mimics the look of subway tiles. A wrought iron chandelier hangs above the island counter adding to the romantic appeal of the space. This kitchen is a lovely combination of traditional and modern elements. 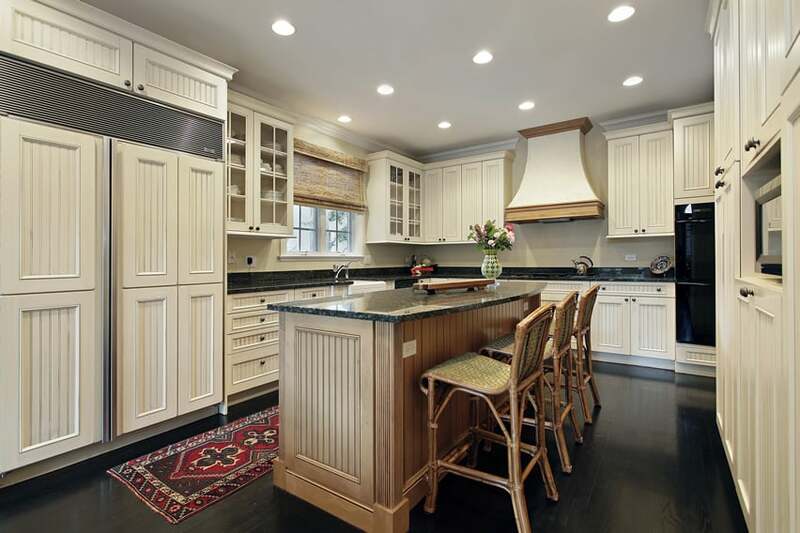 Cabinets are all traditional in design, in a combination of white paint finish and golden maple finish, with crown moldings, French-style doors and flush doors and topped with black solid-surface material for a more seamless countertop. Trendy white subway tiles were used for the backsplash, and walls are in a dark beige color. 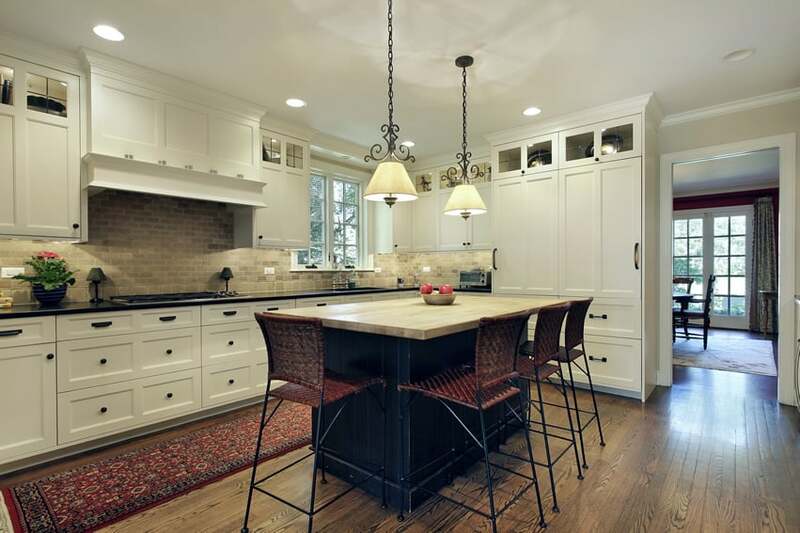 3 pieces of modern pendant lamps hang above the island counter, and 3 pieces of white modern geometric stools were used instead of wooden barstools. For this kitchen, matching is the key, and it is evident with its use of matching wood tones for its floors and the kitchen cabinets. Using a washed-out Oak finish for both its engineered wood floors and the cabinets, this kitchen gives a rustic colors a more polished appeal. Even the gray granite counters and the light beige stone backsplash contribute to the washed-out look of the space, while the stainless steel finishes and the dark wooden bar stools helps maintain a variety of finishes in the space. While it is unusual, it is not unheard of to use wallpaper for the kitchen, as long as the wallpaper used is able to resist exposure to moisture. And this kitchen does just that, using wallpaper not only on its walls, but up to its splashboard. This gives more texture and color to the walls as both the cabinets and the countertops are in plain white color. The dark blue granite of the center island and the golden oak floors also contribute to adding more color to the space as well. 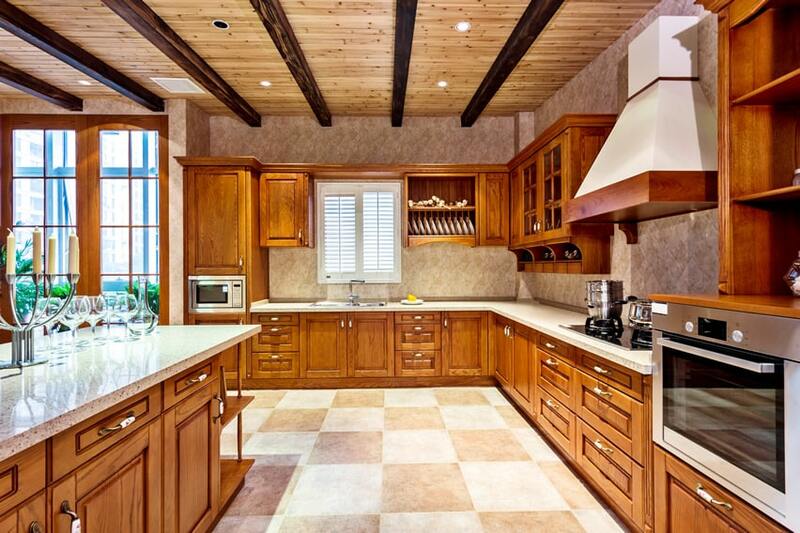 This kitchen exudes a warm and homey feel with its combination of warm-toned wood. 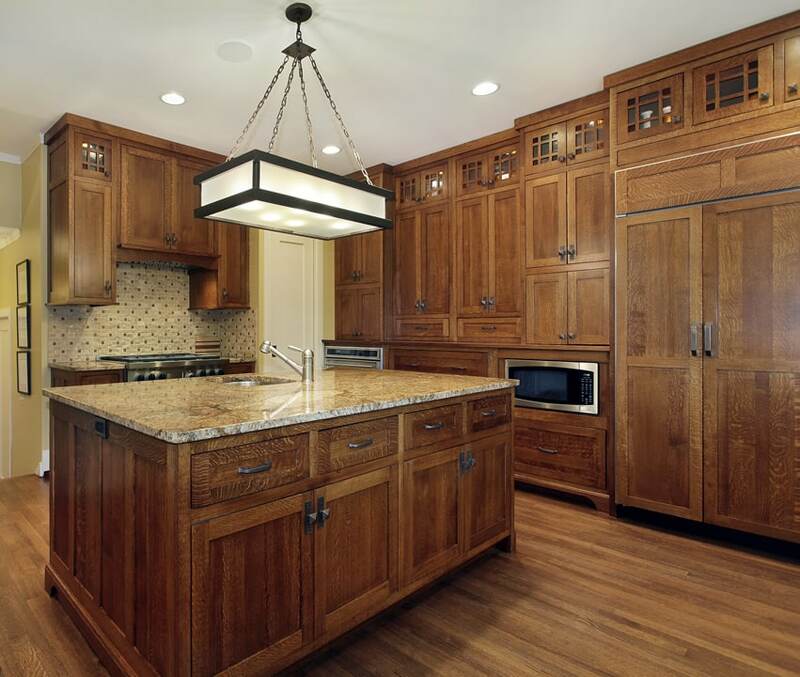 The solid Golden Pecan wood floor boards matches well with the solid provincial Oak wood cabinetry and beige granite countertops. The wall behind the sink has a very large opening, letting much light and air pass-through and circulate. The splashboard uses ceramic tiles with central design and border, and also covers some parts of the wall with bricks. The black quartz stone countertop used in this kitchen is surely beautiful and the winning eye-catcher of this kitchen space. The countertops are illuminated by undercabinet lights, while the backsplash is finished with stone mosaic tiles giving the design a rougher texture in contrast to its smooth white cabinets and black counters. Maple wood finished with polyurethane is used for the butcher block island’s top. Aside from meal preparations it is also a great space to be a breakfast nook. Two decorative pendant lights hang down from the ceiling by a chain giving direct lighting for the island, also an accent for the area. 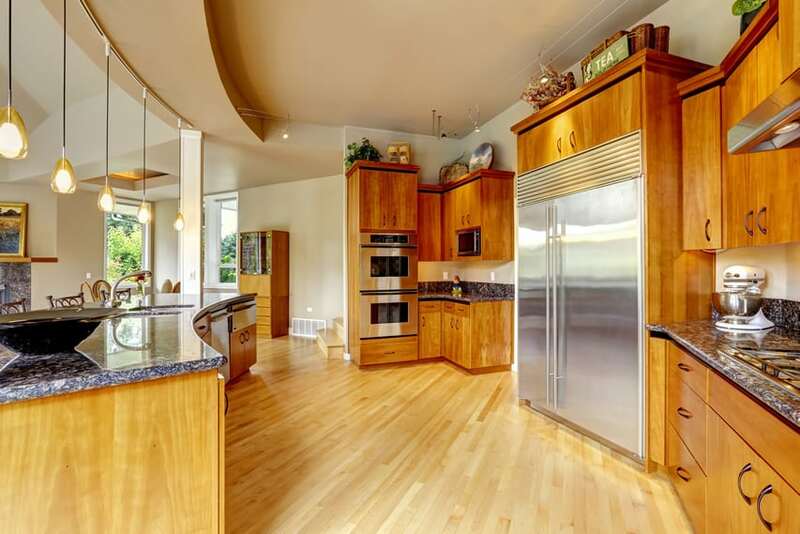 Walls are maximized by having cabinet and overhead cabinets run the whole length of it. Black granite is used for the counter tops while the counter walls are brick-finished giving the kitchen a homier and nonintimidating feel. 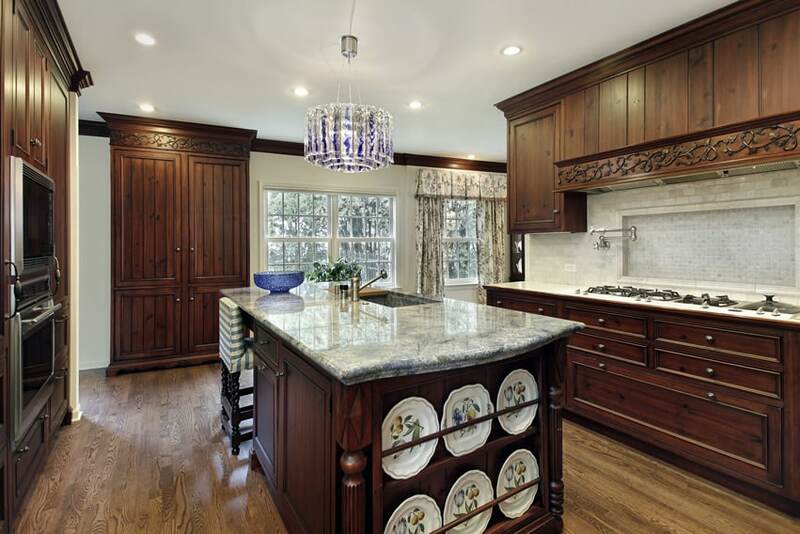 A kitchen design more on the grander side, the kitchen boasts of walnut-fixtures, with decorative moldings. The island houses the kitchen sink and uses marble as its top. The side of the island is used for displaying the owner’s collection of china or other decorative plates. The bar stool for the island has turned legs and striped upholstery as its seat giving the space a soft touch. A chandelier drops down directly above the island and adds more color to an almost monochromatic color scheme. The kitchen design is of a monochromatic scheme. The splash walls, counter top, and even the floor look almost alike. The cabinets are painted cream white with moldings on the doors for added design. The kitchen uses no island which provides more floor space and easier traffic flow. The corners of the cabinets are angled to utilize efficiently the corner space, which most of the time becomes dead space. Also a model of a contemporary kitchen, this is almost of a minimalist design. Pure white quartz for counter tops and walnut wood for kitchen fixtures. The island is the main space for meal preparation, which also houses the range top. 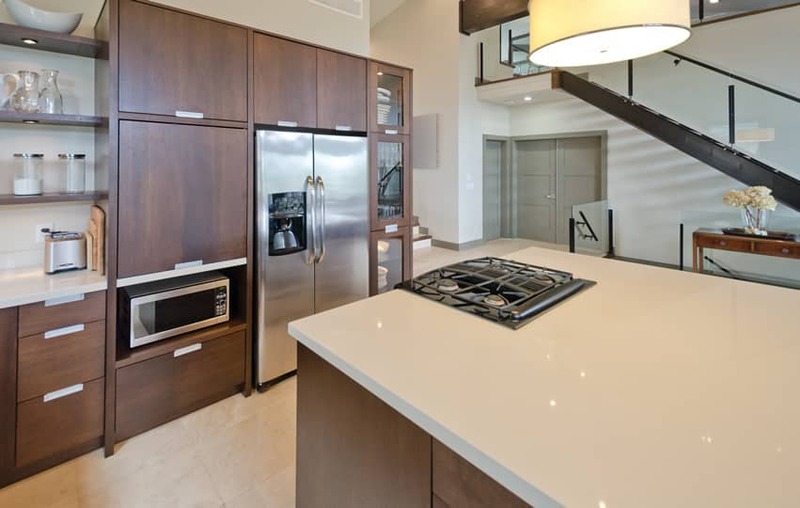 Cabinets below the island are also made available for more storage spaces. 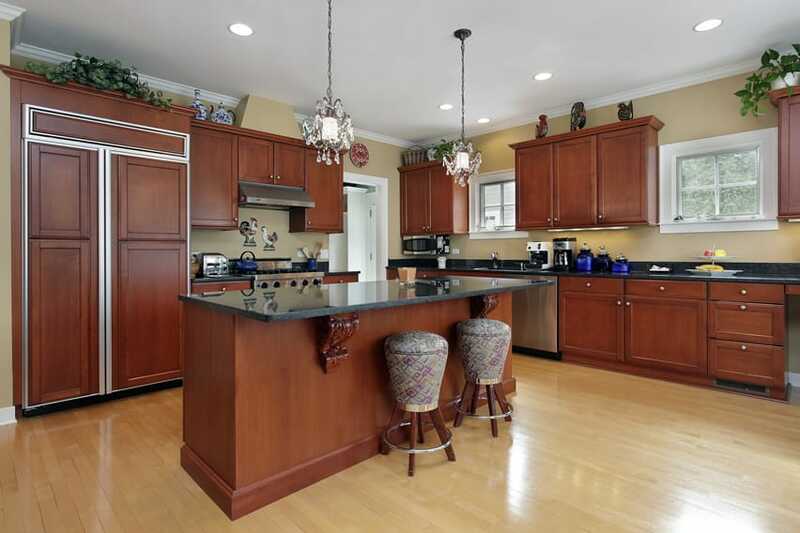 The oak wood floors of this spacious kitchen goes well with the warm red Mahogany paneled kitchen cabinets. It helps brighten up the space, along with the light beige color of the walls and the white ceiling color. For the counters, simple salt and pepper countertop was used, and instead of the usual silver, gold hardware was used for the cabinet pulls. Appliances are all in black instead of the usual stainless steel as well to keep the variation of finishes to a minimum. The spacious kitchen area made it possible for an angular island. 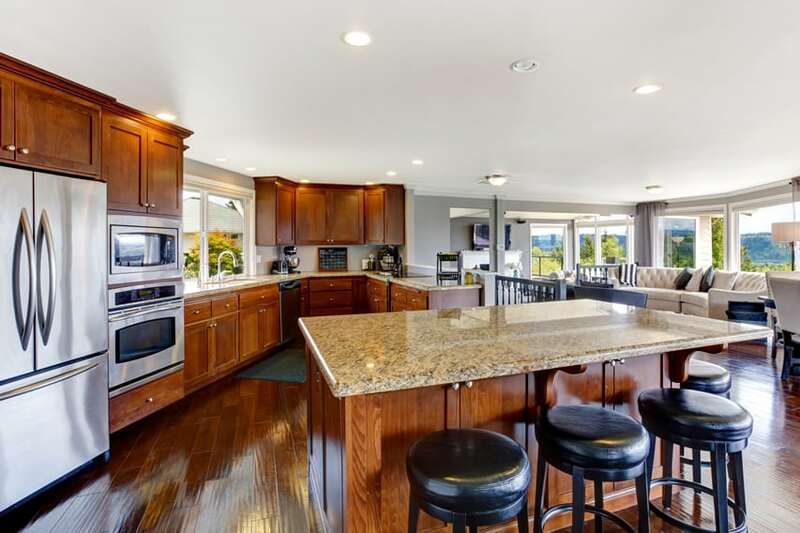 The island with an extended counter top at one side allowing sitting while preparing meals. 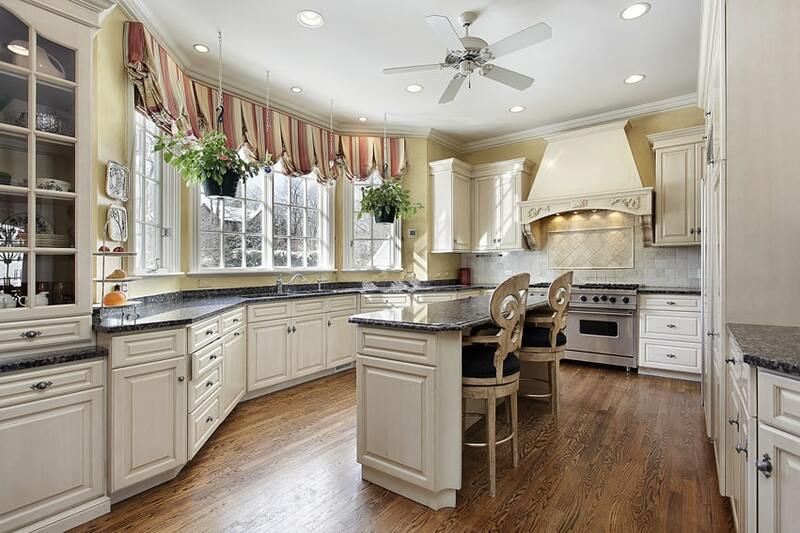 Although spacious, the kitchen has a relatively little counter space. However, the cabinet space are plenty enough for a kitchen this size. 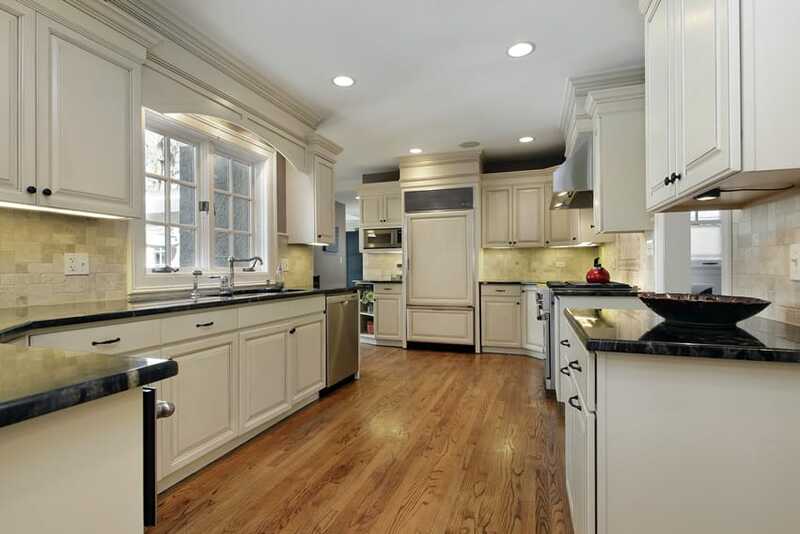 The kitchen’s traffic flow is excellent because of the large amount of floor space. A kitchen where you can admire the natural surroundings of the backyard. The glass windows and doors make it seem like the kitchen is one with the outdoors, and the stone tiles also help with this aspect. 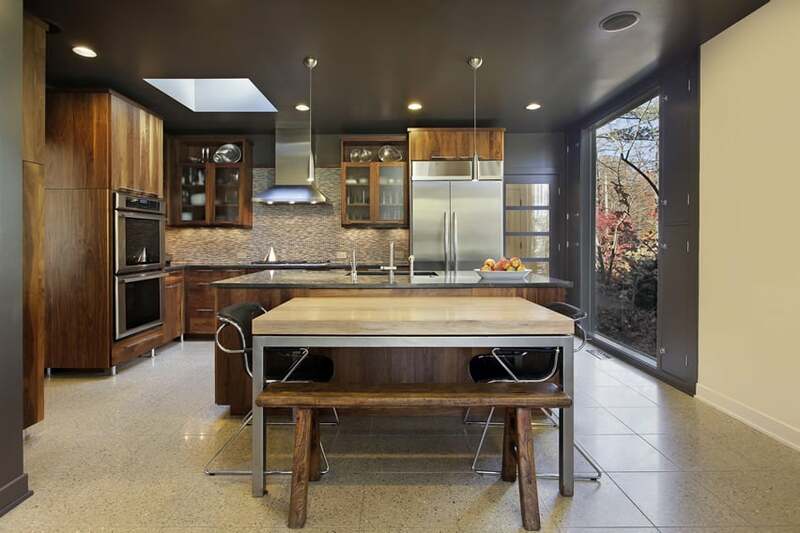 On the other side, the kitchen island made of wood and a granite top serves as a dining counter as well. A niche on the side of the island provides storage or display space. Black granite is used to emphasize areas the designer wanted the people to see, like the stove area and the island. The island gives importance to having people dine on it because it provides ample leg space for comfort. The kitchen provides plenty of storage space using cabinets and to hide the cabinetry for its appliances as well. This is to keep a neat and uniform look for the kitchen. Stone floor tiles are used for an outdoor or countryside feel. And the wall and tile color are of light shade to keep the area bright. 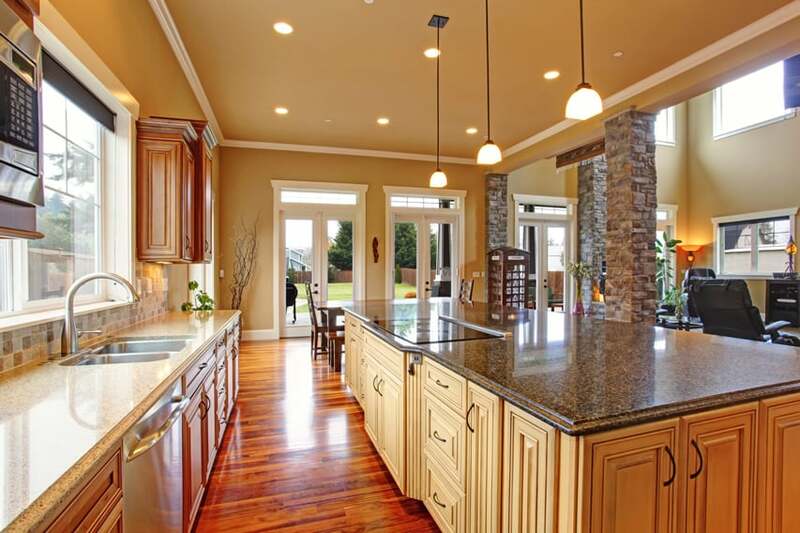 Kitchens with high ceilings can utilize higher cabinets. And the use of pendant lights help in keeping the ceiling from looking too high. The kitchen island uses cabinets for more storage space. Also protrusion from the island which functions as a table is a place where you can dine or prepare meals while sitting down. 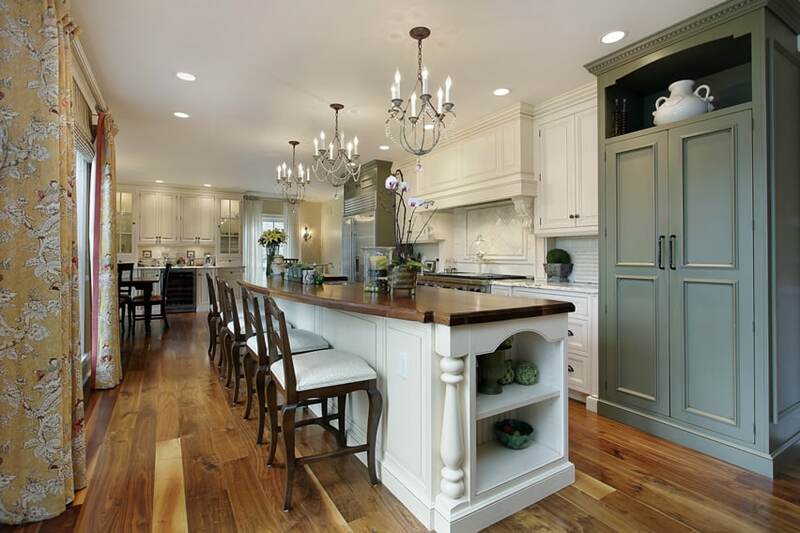 The combination of painted wood and natural wood gives a nice touch and lightens up the kitchen. 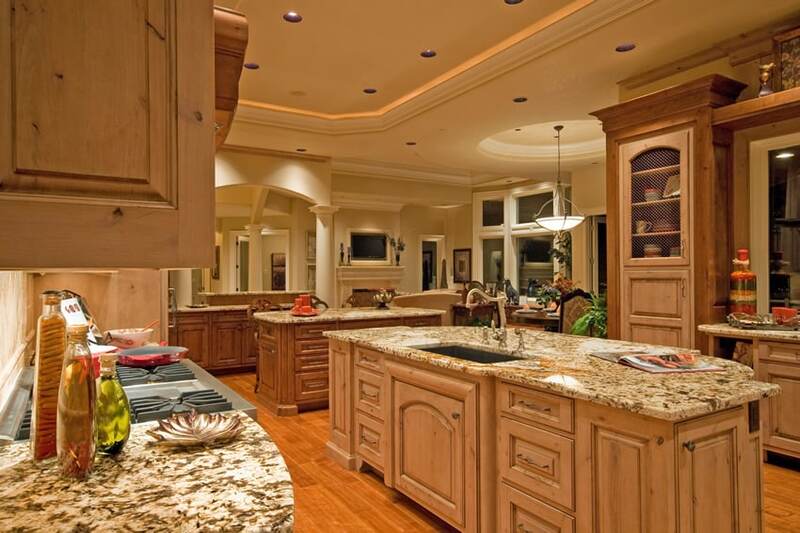 The yellow marble used for counter tops complements both finishes of wood. This kitchen gives priority to cabinet space, thus the minimal counter space. The only counter space made available for preparations are that of the kitchen island. The wall, completely of chestnut cabinets, makes it more possible for a cleaner and more organized kitchen. The cabinets conceal small pieces of electronics for the kitchen. Also more cabinets, means more ways to organize kitchen items. The kitchen island also provides more cabinets. The contemporary chandelier is functions as accent of the kitchen. Luxury kitchen design ideas often feature Victorian kitchen cabinets because they are both beautiful and evoke a feeling of sophistication. 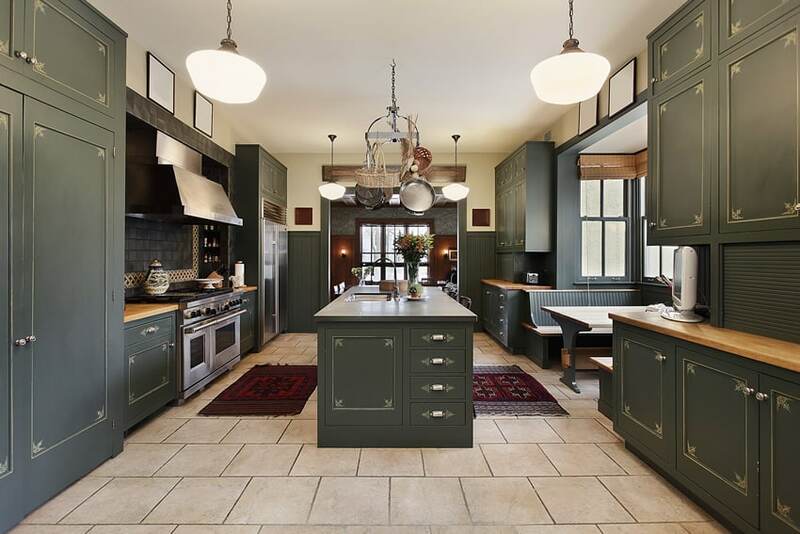 The style used for this kitchen is modern Victorian and an example of a walk-through kitchen or galley. The kitchen island runs as long as the kitchen counter that is against the wall. Aside from meal preparations, the island can also serve as a place to eat. The island is completely of wood, with the body painted white. The electric candle chandelier gives a nice touch to achieve that Victorian feel. The color scheme using subdued hues of colors also remains faithful to Victorian period design. 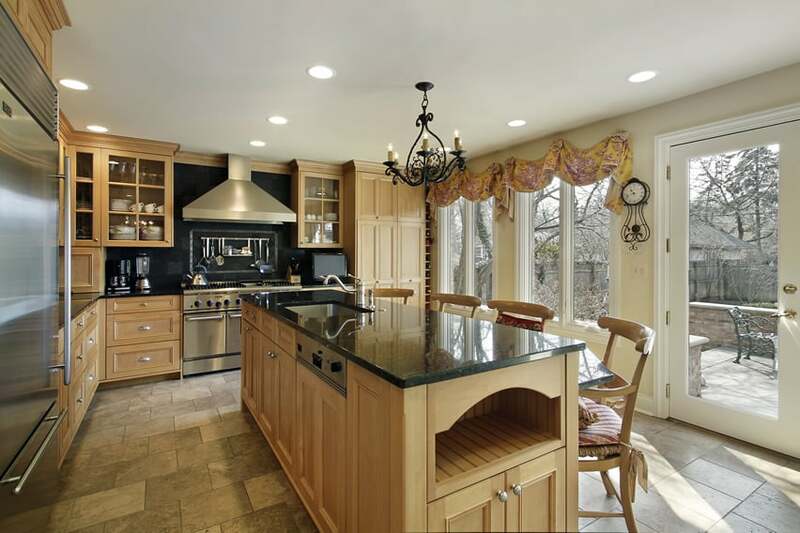 A kitchen with a bay counter is reminiscent of the Victorian Period. The kitchen island’s main purpose is for dining during mornings or in between meal times. The black granite tops creates a clear divide between the white ash cabinets and the visible wall. Stone tiles are used for the splash walls. Indoor plants are also hung from the ceiling not only help in aesthetics but also help in cleaning the kitchen’s air. The kitchen’s dainty look brings a light atmosphere to the kitchen. An L-shaped kitchen with a kitchen island. Stools are provided so preparations may be made while sitting down, or to have a quick meal. Although having the island in the center, the intricately designed range hood would get your attention once you enter the kitchen. The hood has a different design concept, which could be more similar to that of the Victorian period, compared to the rest of the kitchen. 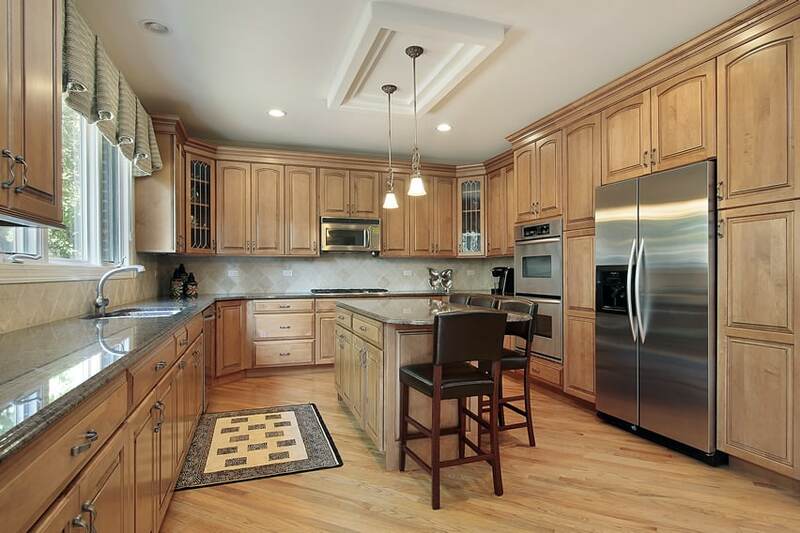 This design features kitchen cabinets that are simple in design with simple moldings. The kitchen island bearing straightforward design, except for the concave corners (which can also be an alternative for rounded edges for safety measures); and the kitchen refrigerator is also designed to blend with the rest of the cabinets. To add color to this kitchen indoor plants are also utilized. L-shaped luxury kitchen design ideas often feature an island to create additional work space and a space for diners to eat. 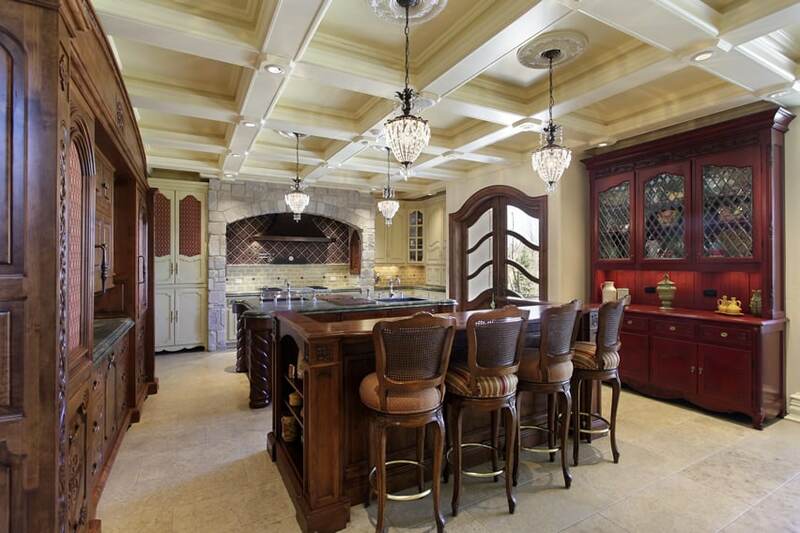 Check out the Luxury Kitchen Designs (Part 1) or (Part 2) here.